Buffalo Chex Mix | I Wanna Bake! 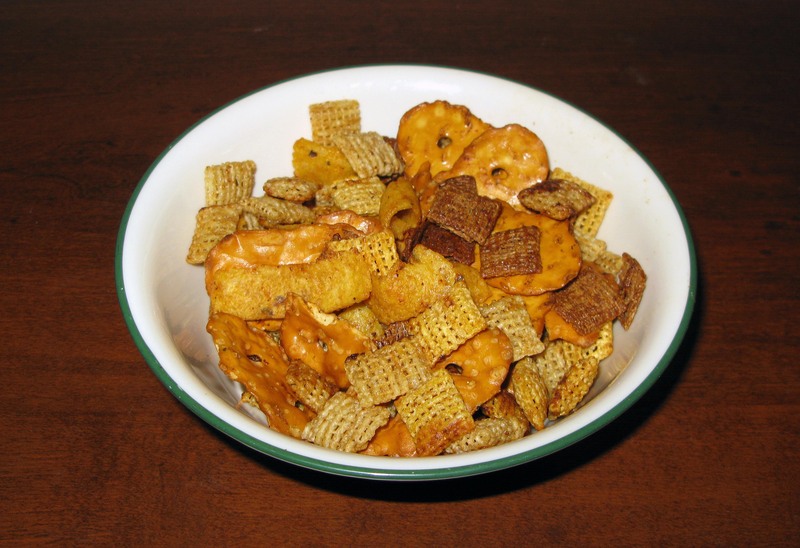 I started with the original Chex mix recipe and made edits from there. I replaced the Worcestershire sauce with Buffalo wing sauce and the standard seasonings with ranch dressing mix and celery salt. I kept the ratio of Chex cereals the same, but as long as it comes out to 9 cups, any blend of your choice should be fine. That also goes for the other mix-ins (dry-roasted peanuts, pretzel thins, and corn chips). If you don’t like one ingredient, you can always try a substitution as long as you maintain the overall volume of ingredients. The ranch flavor isn’t entirely noticeable, but the flavor is good just the same. I am not at all a fan of hot things, but I was able to eat some of this, and Josh seemed to like it. Even if you’re a wimp like me when it comes to spicy foods, you should be ok, but if you reeeeeeally don’t want to use the wing sauce, you could go back to the usual Worcestershire. Alternatively, if you’re one of those crazy people who claims even ghost peppers aren’t really that hot, feel free to substitute the liquid fire hot sauce of your choice. While most Chex mix recipes now tell you to do this in the microwave, I’ve always preferred the oven method. I like to get the ingredients a little toasted, and I don’t think you can really achieve that in the microwave. You can, of course, try it that way by following the instructions in the link above, but I make no guarantees about how it will come out. If you do experiment with the microwave, let me know how it goes! I’m a sucker for some punchy 80’s rock, and this bakeventure is no exception. I tend to stick with favorites such as Van Halen and Aerosmith, but basically any band whose lead singer can get more volume into his long, flowing locks than I can (I’m looking at you, Sebastian Bach) is going to be a good candidate. 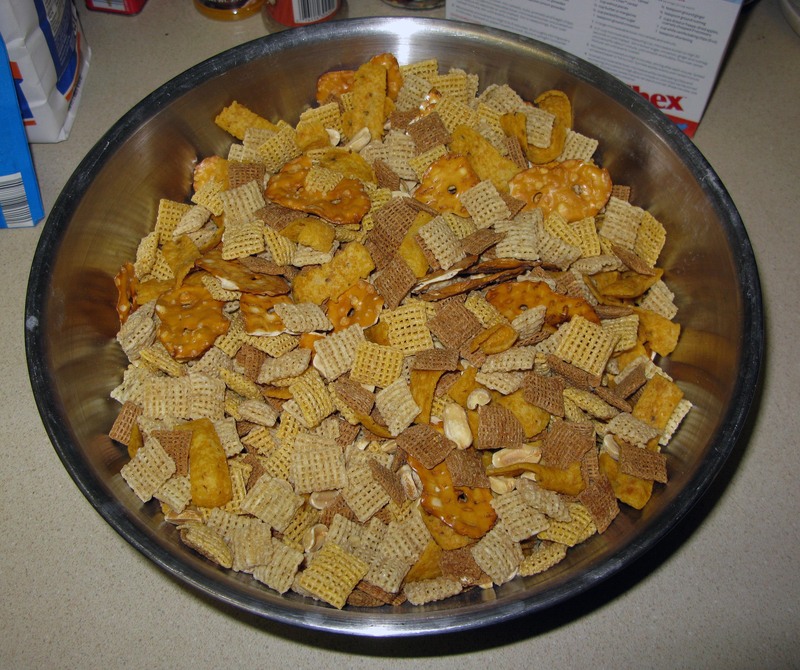 In a large mixing bowl, stir together the Chex, peanuts, pretzels, and corn chips. Cut the butter into tablespoons and put them in a roasting pan or other high-sided baking dish. Melt the butter in the oven (takes about 5 minutes). Stir in the wing sauce until well-combined. Then, stir in the ranch dressing mix and celery salt. 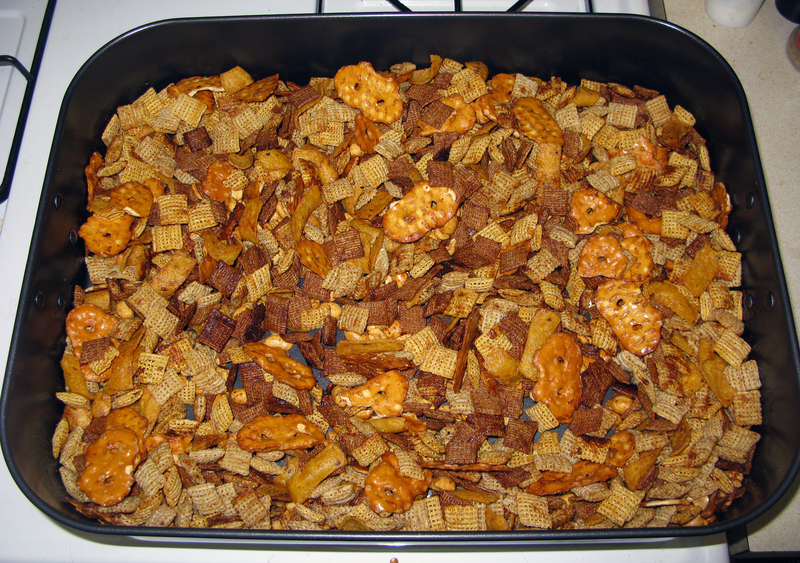 Pour approximately ⅓ of the Chex mix into the roasting pan and stir it until everything is well-coated in the sauce. Repeat the process twice with the remaining mix. 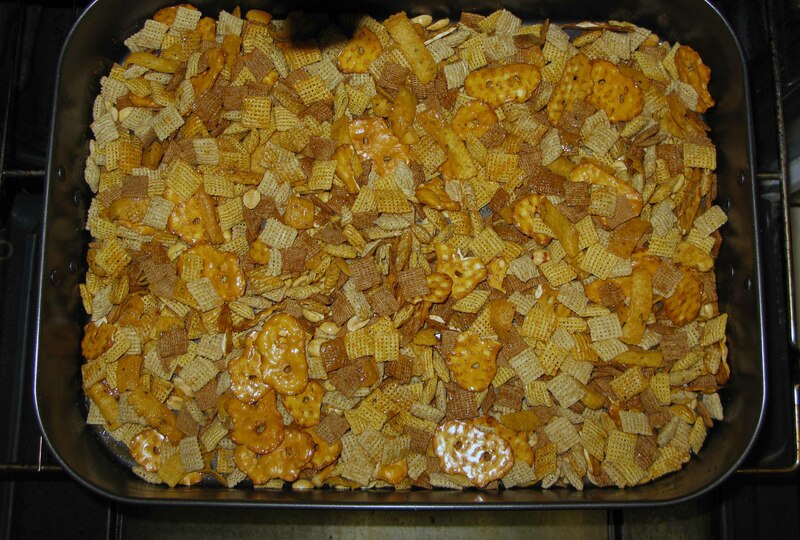 Bake the Chex mix for an hour, stirring every 15 minutes. Try to keep all the ingredients evenly coated in the sauce throughout the baking time. If it starts to look like it’s about to burn before the hour is up, take it out early. At this point, DO NOT put it in your mouth because you will burn your tongue (I may or may not be speaking from a wealth of personal experience with homemade Chex mix…). Leave it to cool completely in the pan, then serve or store it in an airtight container.